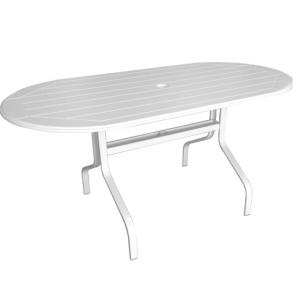 Comfort Height Newport Oval Dining Table |ET&T Distributors, Inc. The Marine Grade Polymer Comfort Height Newport Oval Dining Table is one of the tables available in the comfort height collection. This table top has a slat design. This oval MGP table can be paired with any of the MGP dining collections but is best with the Cape Cod Comfort Height Sling Collection. Care and Cleaning: Windward pool furniture requires only mild soap and water cleaning as needed.